BRAND PROFILE alking into a bar that's smaller than your first studio apartment is a gamble: You're either in for a treat, or your shoes will make that awful stuck-to-dried-beer noise on the way out. But as soon as you open the door to the Roosevelt Hotel's Library Bar, you know: This. Will. Be. Awesome. It's not just the chic décor or exclusive, high-end backbar—it's the waft of fragrant, complex aromas stemming from the veritable buffet of fresh produce, herbs and ingredients spread across the bar welcom- ing you as you walk in the door. "This is clearly unlike any other bar in Los Angeles," states David Ravandi, founder of 123 Certified Organic Tequila, a recently-released quaff that's been inspir- ing mixologists to match the quality of this spirit to the quality of other ingredients in their upscale cocktails. Pronounced Uno Dos Tres, the name refers to the brand's three expressions: Blanco (Uno), Reposado (Dos) and Añejo (Tres). 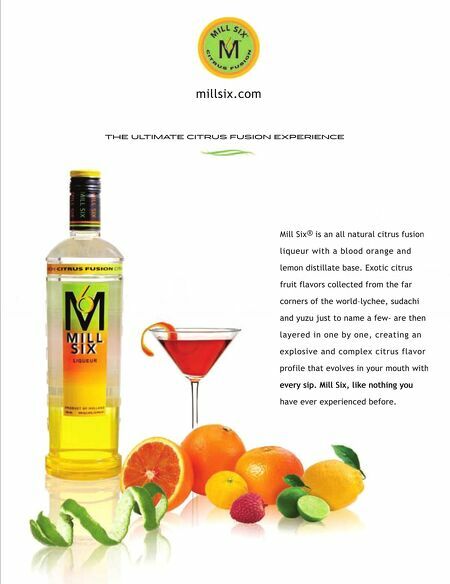 "Because we are organic, because we are such a well- crafted product, our only approach is to do market-fresh mixology." "It's an important movement," continues Ravandi, referring to the industry's shift in focus from pre-packaged, preserva- Market-Fresh Mixology W by Rachel Burkons / photos by George Phaedon AS EASY AS UNO, DOS, TRES tive-laden artificial syrups and sodas to farmer's-market-fresh ingredients that truly make a cocktail—and base spirit— sing. "It's all about putting the cleanest, purest things in your system, and no one does that better than Matt." Ravandi is tipping his hat to Matt Biancaniello, Bar Manager at The Library Bar, and a man so dedicated to fresh ingredients that he even sources honey from his own private hive of bees. Spread in front of him today there's a selection of herbs and ingredients so exotic that we have to ask what most of them are: "That's flowering purple opal basil, flowering cin- namon Thai basil, purple shiso, heirloom honeydew, rhubarb, tarragon, cactus," says Biancaniello, pointing out various ingredi- ents in a rainbow of color and aromas. "Using the best ingredients comes before everything else," explains Biancaniello, who recognizes that all the ingredients in cocktails—both the mixers and the spirit—are essential for a perfect marriage. "I could carry a lot of tequilas, but when you have all of these wonderful fresh ingredients, why would you take something so great and add something that's not made as well? That's why 123 is such a good fit for this kind of cocktail." We challenged Biancaniello to give us the ol' one two (three) with 123, making a cocktail with each expres- sion. Our favorite was the delish drink he made with Dos, the brand's Reposado. "I'm the biggest fan of the 123 Reposado," says Biancaniello, who loves the supple spicy citrus-vanilla notes in Dos. THE WHOLE ENCHILADA created by Matt Biancaniello, The Library Bar at the Roosevelt Hotel, Hollywood, CA ■ ■ ¼ oz. morita-infused Dos tequila ¾ oz. 123 Certified Organic Reposado (Dos) Tequila ■ 1 oz. vanilla-infused Del Maguey Mezcal ■ ■ ■ ■ ¾ oz. agave syrup ¾ oz. fresh lime ¾ oz. fresh passion fruit Garnish with borage flowers. 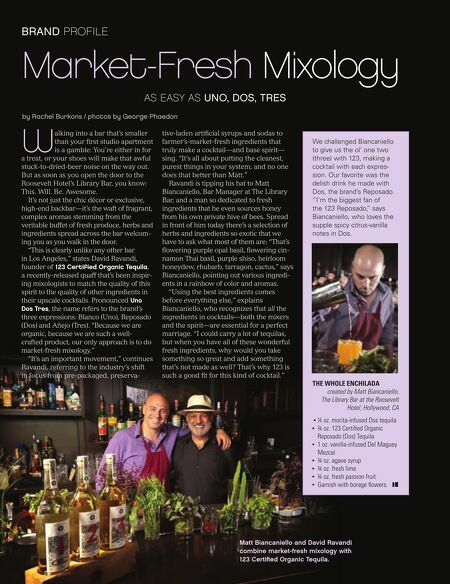 Matt Biancaniello and David Ravandi combine market-fresh mixology with 123 Certified Organic Tequila.